Sri Lanka University News Education Campus School ශ්‍රී ලංකා විශ්ව විද්‍යාල පුවත්: Sri Lanka New President Maithripala Sirisena ! Congratz ! Sri Lanka New President Maithripala Sirisena ! Congratz ! Sri Lanka Presidential Candidate Maithripala Sirisena has won the 2015 Presidential election, Election Commissioner Mahinda Deshapriya officially announced, a short while ago. Warmest Wishes from "Lanka University News"
In an outcome that many would have seemed impossible until a few weeks ago, Sri Lanka's united opposition candidate Maithripala Sirisena defeated incumbent Mahinda Rajapaksa in the country's presidential polls. "I wish to thank the thousands of Sri Lankans who kept their unstinted faith in me. Let's move towards a compassionate Maithree-era", he posted on his official website, soon after it was reported that Rajapaksa had accepted the verdict of the people and had left his official residence, Temple Trees. Sirisena's victory was as emphatic as it was unprecedented. He scored huge wins from the Tamil dominated North and East, and also performed well in the capital Colombo, as well as key parts of the central province. He was largely responsible for galvanising a fragmented opposition and consolidating minority vote banks against Rajapaksa, who had called early elections in an effort to preserve his flagging power. Previously the Health Minister in Rajapaksa's government, Sirisena pulled off the ultimate coup by defecting to the opposition soon after Rajapaksa announced the date of the Presidential election. A stunned Rajapaksa often thundered at political rallies that a man who "ate hoppers with me for dinner" the night before he defected could not be trusted. Sirisena was also the general secretary of the Sri Lanka Freedom Party (SLFP), of which Rajapaksa is also a member. The main plank of his campaign was the excesses of the Rajapaksa family, whose rule he compared to a "corrupt family business". 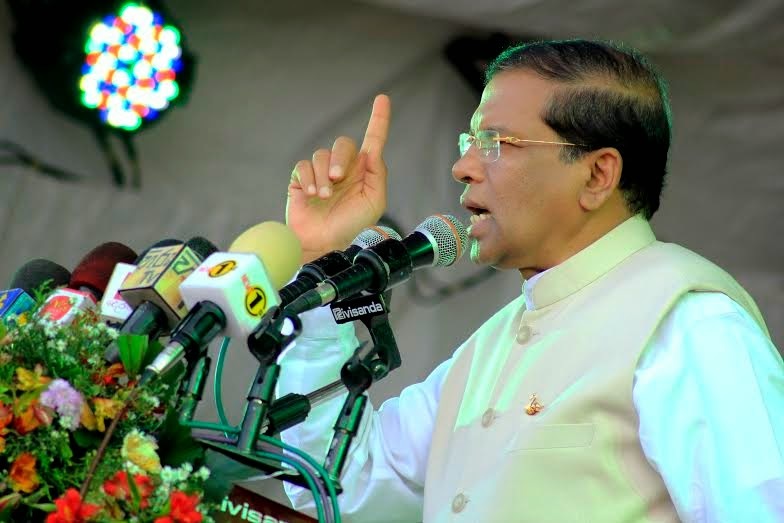 "A war victory and road development cannot be the only reason for re-election," Sirisena said in an interview with al-Jazeera, during his election campaign. 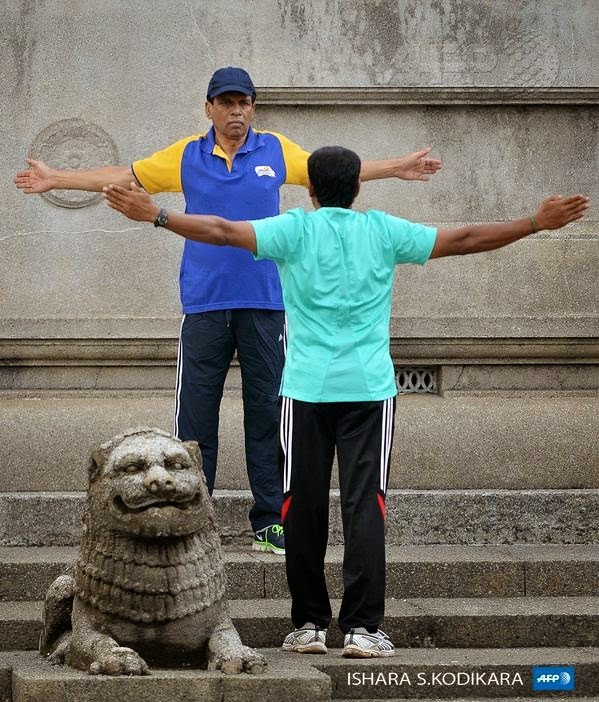 Sirisena himself is a highly experienced politician. He has been active in politics since 1967, joining the SLFP at the age of 17, and has held several ministries since 1994, including that of acting defence ministry. His main election pledges include a pledge to rollback the eighteenth amendment to the Sri Lankan constitution implemented by Rajapaksa that removed the two-term limit to the office of the President. The amendment also proposed the appointment of a parliamentary council that decides the appointment of independent posts like commissioners of election, human rights, and Supreme Court judges -- a move which would have in effect allowed Rajapaksa to dictate these appointments. Sirisena also said he would abolish Sri Lanka's controversial executive presidency and bring back the position of prime minister - which was abolished by Rajapaksa - and reinstate opposition leader Ranil Wickremesinghe as prime minister. He has also pledged to hold parliamentary elections over the next three months. "We are target-oriented, we have goals to achieve within a 100-day period," Sirisena told al Jazeera. Sirisena capitalised on a huge wave of anti-incumbency and anger against Rajapaksa and his family, and utilised social media to the maximum to reach out to people. His page on Facebook was listed by Social Bakers as one of the fastest growing politics pages in the world, a few days before the election. The challenge now for Sirisena will be to move forward with his 'rainbow coalition' which involves both hardline Sinhala nationalist groups and the Tamil National Alliance. He has already pledged to remove high security zones in the North, and return farmland, presently occupied by the military to the people. Sirisena's government will face many challenges as it rolls back Rajpaksa's excesses, the greatest of which will be to meet the daunting expectations of both athe various parties who supported him, and the people who voted for him. පුලතිසිපුර ලක්ෂ උයන ගොවි ජනපදයේ ඉපිද ලොව දිනන්නට සමතෙකු ලෙස හැදී වැඩුණු මෛතී්‍රගේ දෙමාපියෝ සියනෑ කෝරළයේ ගණේමුල්ල ප්‍රදේශයෙන් රජරට ගොවි බිම් වෙත සංක්‍රමණය වූවෝ ය. දෛවෝපගත ලෙස, මෛත්‍රීගේ උපත සිදු වූයේ 1951 සැප්තැම්බර් 02 වැනි දින ශී්‍ර ලංකා නිදහස් පක‍ෂය නිල වශයෙන් ආරම්භ වී හෝරා කිහිපයක් ගෙවී ගිය තැන ය. ශී්‍ර ලංකා නිදහස් පක‍ෂයේ පුරෝගාමී නායකයා වන බණ්ඩාරනායක ශී්‍රමතාණන්ගේ ජන්ම දිනය වන ජනවාරි 08 වැනි දා සමස්ත විපක‍ෂයේ මහා සම්මත අපේක‍ෂකයා වන මෛත්‍රී, ජනාධිපතිවරයා ලෙස ජනතා ඡන්දයෙන් පත් වනු ඇත්තේ රාජධානි යුගයෙන් පසුව රජරටින් බිහිවන පළමු රාජ්‍ය නායකයා වශයෙනි. මෛතී්‍රගේ පියා දෙවන ලෝක යුද සමයේ සකි්‍රය හමුදා සේවයේ යෙදුණු නිලධාරියෙකි. මව පාසල් ගුරු මාතාවකි. 1940 දශකයේ අග භාගයේ දී මෛතී්‍රගේ පියා සිය පවුලේ සමාජිකයන් ද සම`ග පොළොන්නරුවට පැමිණියේ සේවා මුක්ත හමුදා නිලධාරීන් හට ඩී. එස්. සේනානායක රජයෙන් ලබා දුන් ගොවි බිම් අස්වැද්දීමට ය. පොළොන්නරුව තෝපා වැව මහා විද්‍යාලයේ සහ පසුව පොළොන්නරුව රාජකීය විද්‍යාලයේ ශිෂ්‍යයකුව සිටි අවදියේ දී ම සමාජ හා දේශපාලන කරුණු පිළිබ`ද මෛතී්‍ර තුළ තිබූ සහජ උනන්දුව හා කුතුහලය න්‍යායාත්මක දේශපාලන අවබෝධයක් බවට පත් කර ගැනීමට මෛත්‍රීට ඉවහල් වූයේ ලංකා කොමියුනිස්ට් පක‍ෂයේ චීන පිලෙහි නායක ශන්මුගදාසන් සහෝදරයාගේ ඇසුරයි. සමාජවාදී දෘෂ්ඨියෙන් ද සහජ නායකත්ව ගුණයෙන් ද හෙබි මෛතී්‍ර නම් පාසල් ශිෂ්‍ය නායකයා පොළොන්නරුව ශී්‍ර.ල.නි.ප. පාර්ලිමේන්තු මන්තී්‍ර ලීලාරත්න විෙජ්සිංහ මහතාගේ ඇරයුමෙන් පොළොන්නරුව ශී්‍ර.ල.නි.ප. තරුණ සංවිධානයේ ලේකම් ධූරයට පත් වන විට ඔහුට වයස අවුරුදු 17 සපිරුණා පමණි. පසුව 1971 කැරැල්ල සමයේ දී මඩකලපුව බන්ධනාගාරය තුළ මෛත්‍රීට සිරබත් කන්නට සිදු වූයේ ඔහු පාසලේ දී පෙන්වූ සහජ ප්‍රගතිශීලී තරුණ නායකත්ව ගුණාංගය නිසාම ය. බන්ධනාගාරයෙන් නිදහස ලබා පැමිණි මෛතී්‍ර, අනුර බණ්ඩාරණායක මහතා නායකත්වය දුන් සමස්ත ලංකා ශී්‍ර.ල.නි.ප. තරුණ සම්මේලනය තුළ සකි්‍රය භූමිකාවක් ඉටු කරමින් කි්‍රයාකාරී දේශපාලනයට පිවිසියේ ය. තරුණ අවදියේ දී රාජ්‍ය සහ අර්ධ රාජ්‍ය ආයතන කිහිපයක සේවය කළ මෛත්‍රී, 1978 වර්ෂයේ දී ඒ සියල්ලෙන් ඉවත්ව ශී්‍ර.ල.නි.ප.යේ පූර්ණ කාලීන ක්‍රියාකාරිකයකු ලෙස නව දේශපාලන ගමනක් ඇරඹී ය. 1981 වන විට ශී්‍ර.ල.නි.ප. තරුණ සම්මේලනයේ සභාපති ධුරය අනුර බණ්ඩාරනායක මහතා විසින් ද, ලේකම් ධුරය බැසිල් රාජපක‍ෂ මහතා විසින් ද භාණ්ඩාගාරික ධුරය මෛතී්‍ර විසින් ද දැරූ අතර 1982 ජනාධිපතිවරණය අවස්ථාවේ දී බැසිල් රාජපක‍ෂ මහතා එ.ජා.ප.යට එක් වූ විට එම තනතුරෙහි වගකීම ද භාරගත් තරුණ මෛතී්‍රට පොළොන්නරුව ශී්‍ර ලංකා නිදහස් පක‍ෂ සංවිධායක ධුරය ද හිමි විය. පොළොන්නරු දිස්ති්‍රක් පාර්ලිමේන්තු මන්ත්‍රීවරයෙකු ලෙස 1989 දී තේරී පත් වූ මෛතී්‍ර, 1994 පොදු පෙරමුණු ආණ්ඩුවේ වාරිමාර්ග නියෝජ්‍ය අමාත්‍යවරයා ලෙස පත් විය. 1997 දී සිදු කළ එම ආණඩුවේ පළමු කැබිනට් සංශෝධනයේ දී ඔහු මහවැලි සංවර්ධන අමාත්‍යවරයා ලෙස පත් කෙරිණි. එතැන් පටන් මෛතී්‍රගේ දෙශපාලන ජීවිතයේ වගකීම් බහුල කාල පරිච්ඡේදයක් උදා විය. ශී්‍ර.ල.නි.ප.යේ උප ලේකම් ධුරයට 1997 වසරේ දී පත් වූ මෛත්‍රී, 2001 වසරේ දී පක්ෂ මහ ලේකම් ධුරයට පත්ව පුරා වසර 14ක් අඛණ්ඩව එම තනතුර දරයි. එමෙන්ම, ඔහු තවත් ප්‍රධාන කැබිනට් අමාත්‍ය ධුර ගණනාවක් එක්වර දරමින් සිය විෂය ක්ෂෙත්‍ර තුළ පුරෝගාමී සහ විප්ලවීය කාර්යයන් ගණනාවකට නායකත්වය දුන්නේ ය. ගොවි ජන හද ගැස්ම සැබෑ ලෙස හ`දුනන මෛත්‍රී, කෘෂිකර්ම සහ මහවැලි සංවර්ධන අමාත්‍ය ධුරය දරමින් තමා හැදී වැඩුණු සාම්ප්‍රදායික කෘෂිකාර්මික පරිසරයේ පාරම්පරික දැනුම, නව ලොව දැනුම සම`ග මුසු කරමින් නිර්මාණශීලී කෘෂි ව්‍යාපෘති ගාණනාවක් රටට හඳුන්වා දුන්නේය. තව ද, අස්වනු වැඩිකර ගොවියා සමෘද්ධිමත් කරනු වස් සහනාධාර රැසක් ලබා දීමට ද ඔහු පුරෝගාමී විය. මොරගහකන්ද - කළුග`ග සහ වලවේ වම් ඉවුර වැනි වාරි යෝජනාක්‍රම දියත් කළේ මෛත්‍රී විසිනි. වසර ගණනාවක සිට මෛත්‍රී කළ අරගලයක ප්‍රතිඵලයක් ලෙස කිලෝ 50 පොහොර මිටිය රුපියල් 350 ට ගොවි ජනතාවට ලබා දීම පිළිබ`ද සන්ධාන ආණ්ඩුවේ පොරොන්දුව යථාර්ථයක් කරවීමට හැකි වූයේ කෘෂිකර්ම ඇමතිවරයා ලෙස මෛත්‍රීගේ කැප වීම හේතුවෙනි. කලක් අකර්මණ්‍යව පැවති වී අලෙවි මණ්ඩලය සම්පූර්ණයෙන් වසා දැමීමට 2000 වසරේ දී කෘෂිකර්ම ඇමතිවරයා ලෙස දි.මු. ජයරත්න මහතා පාර්ලිමේන්තුවට ගෙන ආ පනතට එකහෙළා එරෙහි වූ මෛතී්‍ර, එය පරාජය කිරීමට විපක‍ෂයේ හා ආණ්ඩුවේ මන්ත්‍රීවරුන්ගේ සහයෝගය ලබා ගත්තේ ය. එසේ, වී අලෙවි මණ්ඩලය රැක ගත් මෛත්‍රී 2005 වසරේ දී කෘෂිකර්ම අමාත්‍යවරයා ලෙස පත් වූ පසුව එය පූර්ණ බලැති රාජ්‍ය ආයතනයක් බවට පරිවර්තනය කළේ ය. සහතික මිල යටතේ වී මිලදී ගැනීමේ රාජ්‍ය යාන්ත්‍රණය අදත් ක්‍රියාත්මක වන්නේ එදා මෛත්‍රී යළි ගොඩ නැ`ගූ වී අලෙවි මණ්ඩලය මගිනි. දේශීය ආහාර නිෂ්පාදනය ජාතික මට්ටමින් ඉහළ නංවා රට අහරින් ස්වයංපෝෂිත කිරීමට දියත් කළ zඅපි වවමු - රට න`ගමුZ වැඩසටහන මෛත්‍රීගේ සංකල්පයකි. එය සැබවින් ම ගොවියා රජ කරවන වැඩසටහනක් විය. ඒ තුළ, වසරකට රට පුරා ප්‍රාදේශීය ලේකම් කොට්ඨාස මට්ටමින් වප් මඟ=ල් උත්සව සංවිධානය කෙරුණු අතර පුරන්ව ගිය කුඹුරු අක්කර දස ලක්ෂයකට වඩා යළි අස්වැද්දීමට හැකි විය. ගෙවත්තේ සිට නාගරික තට්ටු නිවාසය දක්වා අඩුතරමින් එළව`ඵ පැලයක් හෝ වගා කිරීමට රට ම පෙළ ගැසුණු යුගයක් එම`ගින් ඇරඹිණි. zඅපි වවමු - රට න`ගමුZ වැඩසටහනේ සාර්ථකත්වය කෙසේ ද යත් එය ආණ්ඩුවේ ම ඇතැම් පාර්ශ්වයන්ගේ ඊර්ෂ්‍යාවට ද පාත්‍ර විය. මෛතී්‍ර සෞඛ්‍ය අමාත්‍යවරයා ලෙස කටයුතු කළ 2010 - 2014 කාලය තුළ ඔහු ඉටු කළ සේවාව අද්විතීය වේ. අප රට දුම්වැටියෙන් සහ මධ්‍යසාරයෙන් මුදවා ගැනීම ස`දහා ඔහු ගෙන ගිය හුදකලා අරගලය අගයමින් ලෝක සෞඛ්‍ය සංවිධානය හා හාවර්ඩ් විශ්වවිද්‍යාලය 2013 වසරේ දී ඔහු සම්මානයට පාත්‍ර කිරීම එය සනාථ කිරීමකි. දුම්වැටි හා මධ්‍යසාර භාවිතය අවම කිරීම පිණිස මෛත්‍රී විසින් ගෙන එන ලද පනත් කෙටුම්පත මෑත කාලීනව රටේ මහත් ආන්දෝලනයකට ලක් වූවකි. එම පනත ම`ගින් සිගරට් පැකට්ටුවේ පිළිකා අවදානම දැක්වෙන රූපමය කොටස 80% ක් විය යුතු බව නිර්දේශ කර තිබිණි. එහෙත් අවසානයේ දී එය 60% දක්වා අඩු කිරීමට සිදු වීම පිටුපස ආණ්ඩුවේ ම අදිසි හස්ත කි්‍රයාත්මක වූ බව ප්‍රසිද්ධ රහසකි. මහාචාර්ය සේනක බිබිලේ ඖෂධ ප්‍රතිපත්තිය කි්‍රයාත්මක කිරීමට මෛත්‍රී සෞඛ්‍ය අමාත්‍යවරයා ලෙස නොබියව ඉදිරිපත් වුව ද ඖෂධ සමාගම් සහ ආණ්ඩුවේ කප්පම් මාෆියාව ඊට අකුල් හෙළී ය. ශී්‍ර ලංකාවේ නීති කෙටුම්පත් දෙපාර්තමේන්තුව තුළ දී එම පනත් කෙටුම්පත අතුරුදහන් වීම ජනතාවගේ අවාසනාවයි. දශක හතරකට අධික දේශපාලන අත්දැකීම් සමුදායකින් පරිපූර්ණ වූ මෛත්‍රී ත්‍රස්තවාදීන්ගේ ඝාතන ප්‍රයත්න වැඩි ම සංඛ්‍යාවකින්, එනම් ආසන්න ඝාතන උතසාහයන් පහකට මුහුණ දුන් සිංහල ජන නායකයා ය. සැබවින් ම, ඔහු බොරලැස්ගමුවේ දී මුහුණ දුන් මරාගෙන මැරෙන ත්‍රස්ත ප්‍රහාරයෙන් නිරුපද්‍රිතව දිවි ගලවා ගත්තේ ජාතියේ වාසනාවට ය. 2009 මැයි මස යුද්ධයේ අවසන් දින කිහිපය ද ඇතුළුව අවස්ථා පහක දී ම වැඩබලන ආරක්ෂක අමාත්‍ය ධුරයේ කටයුතු කළ මෛත්‍රී සිය වගකීම නිර්භයව ඉටු කළ නායකයෙකි. පසුගිය දශකයකට ආසන්න කාලයක් ශී්‍ර.ල.නි.පය ප්‍රමුඛ සන්ධාන ආණ්ඩුව ලැබූ මැතිවරණ ජයග්‍රහණ සියල්ලට උර දුන් අපරිමිත සංවිධාන ශක්තිය වූයේ ශී්‍ර.ල.නි.පයේ මහ ලේකම් මෛත්‍රී ය. මානුෂවාදී දෘෂ්ටියේ සහ සුපිරිසිදු දේශපාලනයේ ප්‍රතිමූර්තියක් බඳු මෛත්‍රී, ජනතා අරගලයන්ට නායකත්වය දෙන්නෙකි. යුක්තිය සහ සාධාරණත්වය වෙනුවෙන් සටන් වදින්නෙකි. ගොවියා, ගැමියා සහ කම්කරුවා වෙනුවෙන් පෙනී සිටින්නෙකි. මෙම ජනාධිපතිවරණයට මෛත්‍රී පොදු අපේක්ෂකයා ලෙස ඉදරිපත්ව සිටින්නේ දේශපාලන පක්ෂ සහ සංවිධාන 47ක ඒකමතික එක`ගතාවෙනි. ඒ, වර්තමාන ආණ්ඩුවේ දූෂිත, නාස්තිකාර, පවුල් කේන්ද්‍රීය, අත්තනෝමතික සහ ප්‍රචණ්ඩ හස්තයේ ග්‍රහණයෙන් රට ද ජාතිය ද මුදවා ගැනීමේ ජාතික අරගලයට නාකත්වය දීම පිණිස ය. මෛත්‍රී එම එඩිතර තීන්දුව ගත්තේ තමා හමුවේ තැබූ අගමැති තනතුර ද ප්‍රතික්ෂේප කරමිනි. ජාතික අභියෝග හමුවේ සියලූ පක්ෂ එකඟතාවකට එළඹ කටයුතු කිරීම අපි මින් පෙර ද දැක ඇත්තෙමු. ඒ, යම් උපද්‍රවයකින් මිදීම සඳහා සමස්ත ජාතිය ම එක් විය යුතු වූ අවස්ථාවන්හි දී ය. 2004 වර්ෂයේ දී ශී්‍ර.ල.නි.ප.ය සහ ජ.වි.පෙ. අතර ද, 2006 වර්ෂයේ දී ත්‍රස්තවාදය පරාජය කිරීම පිණිස ශී්‍ර.ල.නි.ප.ය සහ එ.ජා.ප.ය අතර ද මෙවැනි ම එකඟතා ගිවිසුම් අත්සන් තැබුණේ ය. එම අවස්ථා දෙකේ දී ම, ආණ්ඩුව සහ ශී්‍ර.ල.නි.ප.ය වෙනුවෙන් එම ගිවිසුම්වලට අත්සන් කළේ මෛත්‍රී ය. 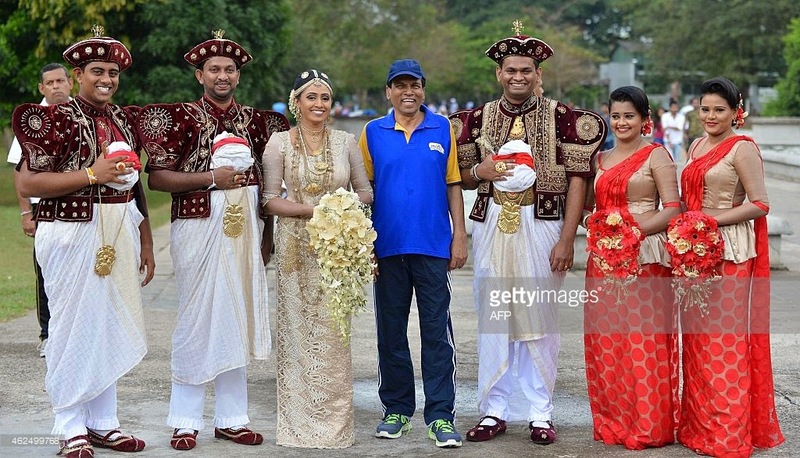 මෙවර ද ශී්‍ර.ල.නි.ප.යේ විශාල පිරිසක් ද සම`ග සමස්ත විපක්ෂය මෛත්‍රී වටා ඒකරාශී වී සිටින්නේ වර්තමානයේ රට මුහුණ දී සිටින පවුල්වාදී දුර්දාන්ත පාලනය නිමා කිරීමටයි. මෛත්‍රී සිය ජීවිතාශාව පවා හැර දමා මේ ජාතික කාර්යය වෙනුවෙන් කැපවී සිටියි. මේ තීරණාත්මක මොහොතේ දී, මෛත්‍රී පාලනයක් වෙනුවෙන් සමස්ත ශ්‍රී ලාංකීය ජාතියටම පියමං කිරීමට සිදුව ඇත්තේ ධන බලය, අවි බලය, මැර බලය, සහ පවුල් බලය ඉහ වහා ගිය මාවතක් ඔස්සේ ය. එහෙත් ඒ සියලූ බලවේගවලට වඩා ජන බලය ප්‍රබල බව එළඹෙන ජනවාරි 08 වැනි දා ප්‍රත්‍යක්ෂ වනු නිසැක ය. මෛත්‍රී පාලනය යනු අවනීතිය වෙනුවට නීතිය රජ කරන, අයුක්තිය වෙනුවට යුක්තිය රජ කරන, අසාධාරණය වෙනුවට සාධාරණය රජ කරන, දූෂණය වෙනුවට පාරදෘෂ්‍යභාවය රජ කරන, සැබෑ මානව ධර්මතාවන්ට ගරු කරන සංස්කෘතියක සහ සමාජ ක්‍රමයක උපතයි.